Why winterizing the shod hoof? And how? 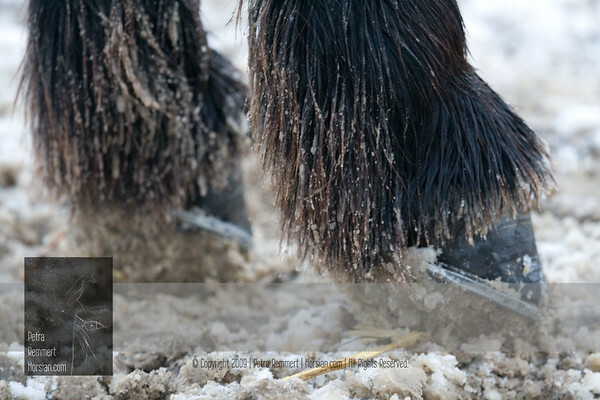 The images show what can happen to a normally shod hoof in snow: "high heels" caused by snow resp. ice accumulation. The simple and economic remedy: hoof grips, rim snow pads or Mustad NoSnow pads. For detailed product information please check a manufacturer, e.g. click here to visit the Mustad website. Ice accumulation created by snow being stuck and compressed in the shoe. Just imagine you would switch from running shoes to high heels and go playing soccer - or run with your buddies.